Needless to say that Ascending Butterfly is counting down to Halloween already as Horror is my favorite movie genre of all time! (Any fellow Horror and Vampire Movie Genre Lovers out there that would get into trouble for slipping their copy of Fangoria Magazine in their school books?) Yesterday's Movie Review was for an all ages Family Friendly title, (Disney Secret of the Wings Movie Review, if you missed it, you could check out HERE) but today's title is most definitely NOT for the kiddos! I didn't get the chance to see this one in the theatres because of my insane travel schedule and now that I got to see it on video I truly regret not catching this one on the 'big screen'. While I'm a huge fan of the genre, I'm the first to admit that most horror movies are a bit plot 'light' and usually disappointing in the end, but I can honestly tell you this one is NONE of those! I greatly enjoyed this movie! For the life of me I could not conceive how Vampires and Abraham Lincoln would come together, but they really did do it somehow! 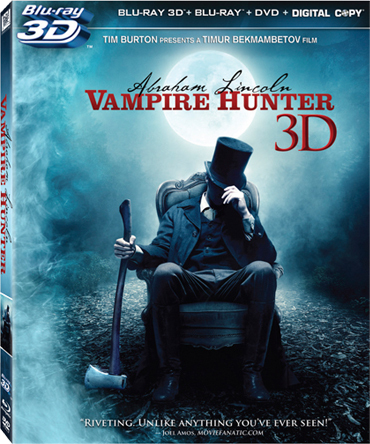 English: The election season is about to get a whole lot bloodier as historical legend throws his hat into the ring in ABRAHAM LINCOLN: VAMPIRE HUNTER, arriving on Blu-ray™3D, Blu-ray™ and DVD October 23 from Twentieth Century Fox Home Entertainment. A citizen by day and a hunter by night, this action-packed film with cutting-edge visual effects shows the Lincoln you know – with one additional quality of which you were unaware... until now. Based on the New York Times Best Seller novel by Seth Grahame-Smith, ABRAHAM LINCOLN: VAMPIRE HUNTER stars Benjamin Walker (Flags of Our Fathers), Dominic Cooper (Captain American: The Frist Avenger), Anthony Mackie (The Adjustment Bureau), Mary Elizabeth Winstead (Scott Pilgrim vs. The World) and Rufus Sewell (The Tourist). The Blu-ray™ 3D and Blu-ray™ are loaded with killer content and hard action, including an exclusive never-before-scene animated graphic novel prequel about the origins of vampires in the U.S.A.
Spanish/Espanol: La temporada de elecciones está a punto de obtener un montón radicalizarse como leyenda histórica lanza su sombrero en el anillo de ABRAHAM LINCOLN: VAMPIRE HUNTER, llegando el Blu-ray ™ 3D, Blu-ray ™ y DVD el 23 de octubre de Twentieth Century Fox Home Entertainment. Un ciudadano por día y un cazador de noche, esta película llena de acción muestra efectos visuales de vanguardia el Lincoln sabes – con una calidad adicional que desconocían... hasta ahora. 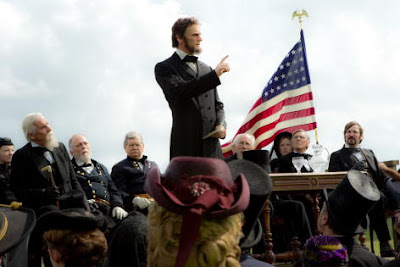 ABRAHAM LINCOLN: VAMPIRE HUNTER explora la vida secreta de Abraham Lincoln antes de convertirse en Presidente y la historia no contada que formaron nuestra nación. Traen cineastas visionarios (Dark Shadows) de Tim Burton y Timur Bekmambetov (Wanted) trae una voz fresca y visceral a la tradición sanguinaria del vampiro, imaginando a Lincoln como el cazador mayor de history de los muertos vivientes. Basada en la novela superventas del New York Times por Seth Grahame-Smith, ABRAHAM LINCOLN: VAMPIRE HUNTER estrellas Benjamin Walker (Flags of Our Fathers), Dominic Cooper (Capitán América: El Vengador de Frist), Anthony Mackie (The Adjustment Bureau), Mary Elizabeth Winstead (Scott Pilgrim vs el mundo) y Rufus Sewell (el turista). El Blu-ray ™ 3D y Blu-ray ™ se cargan con la acción de contenido y dura asesina, incluyendo un exclusivo nunca-antes-escena animada gráfico novela precuela sobre los orígenes de los vampiros en los EE. I had the same reaction most people had when they heard about this title, 'yeah right'. But I can tell you that as Far Fetched as it may seem, it really does come together, you get invested in the characters, it's well-paced, isn't just solely relying on special effects, and does not let you down! This one is definitely a winner for your Halloween Weekend viewing and for your Horror/Vamp Movie Collection! If you already saw this one, what did YOU think YAY or NAY? Did you catch them at Comic Con This Year?